Recently it has become an online trend to be socially active and involved in public issues. This kind of activism is thriving: like if you care. Immediately there are hundreds/thousands/million likes and comments under a post that suggests supporting some problem or a relevant matter and it goes straight up to our news feed. By clicking these posts people feel aware and helpful in solving public issues. However the question remains if by engaging in social activism via social media means we can actually make a change regarding a particular incident? “Actions performed via the Internet in support of a political or social cause but regarded as requiring little time or involvement”. By analyzing this definition we come across that it has a negative side. According to Morozov (2009) online activism on social media has zero political or social impact (Jones). One of the worst examples of slacktivism in history is #BringBackOurGirls campaign when Islamic militants kidnapped 276 Nigerian schoolgirls. People outraged online, took thousands of selfies and they raised virtual awareness. However, the girls were not rescued and there were even 30 more girls kidnapped (“The Problem with #slacktivism”). Therefore, sometimes it is not enough to solve serious problems just by sitting in your room and clicking posts. This gets even more complex when the issues are more complicated. Just by pressing the like button on the new song by Kanye West the same day you express digital solidarity with kidnapped children in Africa is quite different matters but it all sort of looks the same at the keyboard (Carr). Moreover it has become so popular to follow up on various disasters online that Facebook has recently developed new features in its’ interface for users to show their support for trending causes. 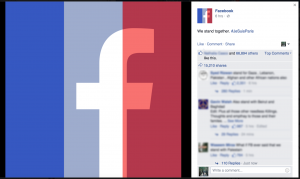 For instance, when Paris attacks happened in November 2015 there was a new feature introduced on Facebook and users could add French flag colors to their profile picture. This activity can be related to James J. Gibson’s theory of affordances whenever there is change in the environment we get new possibilities of actions and even in the digital medium. A lot of people all over the world applied that new feature and changed their profile pictures to show how sorry they were for Paris attacks. Hence by using some nudges and algorithms in tandem Facebook has made such global caring inevitable. Sadly, under the picture it said “temporary profile picture”. So this appeals that whenever this social activism trend ends users will change their pictures back and probably will forget how sad it was that day. Also around similar date deadly attacks happened in Beirut but Facebook did not add any changes to their interface about this cause and people were not talking about it as much as the Paris attacks. These situations unfortunately prove that mostly people show their support only when it is trending in their news feed. In this sense, social media activism becomes a digital version of graffiti as it is only referring to itself and not the actual cause. Nevertheless, there are some positive examples of slacktivism as well. The famous “Ice bucket challenge” that took place in summer of 2014 actually raised enough money to fund ALS breakthrough and helped to identify a new gene of the disease. Though it also got criticized because the charity part was left a bit postscript and people mostly just enjoyed pouring a bucket of ice on themselves and posting that video online by challenging other friends. However, a lot of people actually did donate and the company raised $100 million in 30 days so this resulted in funding research projects greatly (Woolf). Another great project that is currently happening in several continents is called “Liter of Light” (“Liter of Light”). This NGO is acting slightly through a different lens as they are not being loud on social media but they invite popular social media personalities to participate and actually do great work together. Jerome Jarre has over 2 million likes on his page on Facebook and he is traveling with this project installing green energy lights in villages in Africa, Asia or South America. By making videos and pictures of people that live there and the work they do as well as getting sponsors for the project he creates awareness by actually making a change. Even though slacktivism is criticized a lot by professionals it has proven to be capable of helping in some matters. Certainly it has become a trend to be seen involved and caring online because people want to feel good about themselves with as less effort as possible. However, some people get really interested and active in particular topics they see on social media so they would even donate money or showed up for the protest. Nevertheless it is better to be aware of the problems we are facing in the world today than to be ignorant. Carr, David. “Hashtag Activism, and Its Limits.” The New York Times 25 Mar. 2012. NYTimes.com. Web. 15 Sept. 2016. Jones, Cat. “Slacktivism and the Social Benefits of Social Video: Sharing a Video to ‘help’ a Cause.” First Monday 20.5 (2015): n. pag. firstmonday.org. Web. 15 Sept. 2016. “Liter of Light.” Liter of Light. N.p., n.d. Web. 15 Sept. 2016. “The Problem with #slacktivism.” Macleans.ca. N.p., 11 Nov. 2014. Web. 15 Sept. 2016. Woolf, Nicky. 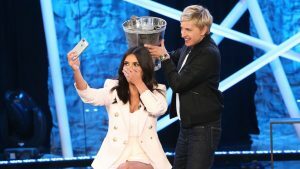 “Remember the Ice Bucket Challenge? It Just Funded an ALS Breakthrough.” The Guardian 27 July 2016. The Guardian. Web. 15 Sept. 2016.